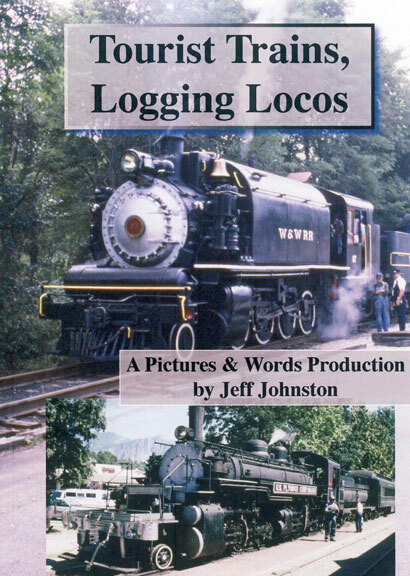 This DVD is a transfer from an older VHS tape that’s a collection of logging locomotives in operation at various tourist railroads. The footage was shot using a good-quality VHS camera during the late 1980s and early 1990s. Two of the locos, Kosmos #11 2-6-6-2 (Northwest RR Museum, Snoqualmie, WA) and the Sugar Pine Lumber Company #4 2-8-2T (Wilmington & Western Railroad, Wilmington, DE) have been out of service for years with no return-to-service dates in sight. The Mt Rainier Scenic Porter #5 2-8-2 (Elbe, WA) and Westside Shay #15 (Yosemite Mtn Sugar Pine RR, Fish Camp, CA) are still alive and kicking and always fun to watch. BONUS FEATURE: 8mm silent footage, by Richard Ehmann, of a Klickitat Shay working the dump and Rayonier #120 2-6-6-2 in Railroad Camp and hauling logs in the woods.